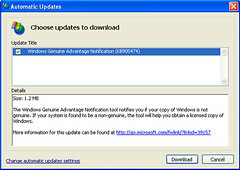 Windows Genuine Advantage Notification | No Soap, Radio! Normally, I blur out on Microsoft Updates, but this one is excellent. I only wish I could have been included on the meeting that devised the name for this update.